Why Pressure Cooker is becoming a Must-have in Every Kitchen? In the morning when you are rushing for work or preparing your kids for school,a whistling sound from your kitchen is quite normal these days.It is nothing but just a covered pot that comes to our rescue whenever you are in some hurry. 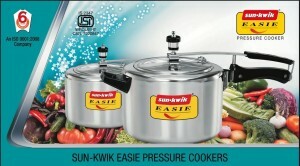 To keep up with the faster pace of life,a pressure cooker is becoming a must have in every kitchen. Especially after the invention of induction ovens,pressure cooker manufacturers are coming up with new designs cookers with advanced utility.It is helpful as it helps you to cook faster than anything. But it cannot be the only benefit of it.Otherwise the demand of this utensil would have never reached such height. 1.) Food cooked in pressure cooker retains most of the nutrients and taste.When you are cooking in an open stove top the nutrients evaporates with the steam.But when you are cooking in pressure cooker,it lets the right amount of steam to go out. As a result most of the nutrients remain in the pot.The food also becomes tastier than the food cooked in open pot. 2.) The pressure cooking process saves energy.Since the food is cooked in closed pot,it is cooked faster.It results in saving energy.Open pot cooking needs more heat for a longer period.Pressure cooking compensates that energy loss. 3.) It helps to cook faster.Undoubtedly when you are cooking in an open pot it takes a lot of time to prepare any dish.But pressure cooking has become the synonym of fast cooking. 4.) Pressure cooking helps to retain the healthy,hygienic and cool atmosphere in the kitchen.The stove top remains clean and the atmosphere remains cool.The food never spills out and it saves your labor too.It also reduces he foul smell after cooking. So,from next morning when you will be in rush,don’t forget to bring out your best friend from cupboard.Eat healthy,stay healthy. Prepare Thai Red Curry In A Pressure Cooker Now. Recipes That Prove A Fry Pan Is A Must-Have Kitchen Appliance. Choose The Pressure Cooker That Suits Your Kitchen Needs. Which One Is Better, Pressure Cooking Or Open Cooking?